The reply comes in the wake of a Right to Information (RTI) plea by senior activist, Venkatesh Nayak, who is with the Commonwealth Human Rights Initiative (CHRI), a Delhi-based NGO. The Ordnance Factory Board (OFB), which operates under the Ministry of Defence, Government of India, is engaged in research, development, production, testing, marketing and logistics used in air, land and sea. The reply further says that the OFB does not manufacture “anti-riot weapons such as pellet guns but only the ammunition used with it.” Interestingly, instead of providing the information sought under RTI, the OFB just “printed out the webpages from the OFB's website regarding the specifications of the pellet cartridges and sent them to me after stamping them with a seal saying document issued under the RTI Act", says Nayak. Nayak wonders, in an email alert, if the Khadki Ordnance Factory (OFK), Kokata, operating under OFB, does not manufacturing the anti-riot weapon called pellet guns, where are law enforcement agencies, particularly the Central Reserve Police Force (CRPF) in J&K, buying these pellet guns from. OFK is a public sector enterprise which sells arms and ammunition not only to the defence forces and law enforcement agencies but also to civilians in the form of weapons for hunting, sporting and self-defence. According to a news report, the Indian paramilitary fired up to 3,800 cartridges between July and August, each containing 450 metallic balls, totaling up to 1.7 million pellets. 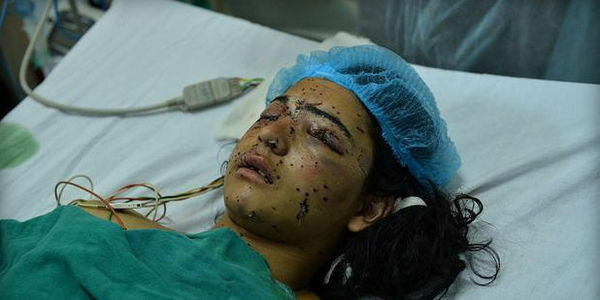 About 3,000 civilians have been injured due to pellet guns as of 24 August. Meanwhile, Nayak says, a Ministry of Home Affairs (MHA) Committee report on riot control methods remains a secret. The committee, was formed following reported instances of numerous youngsters being injured severely by pellet guns, resulting in extensive eye damage, many of whom were innocent bystanders. “The seven-person committee said to have submitted its report to the Government. This report has not been officially placed in the public domain. There is an urgent need to make the report public. A similar report prepared in 2010 was made public by the Delhi Police after I filed an RTI application”, says Nayak. “There is no reason why the 2016 report should not be made public, especially, when organisations like OFK are manufacturing ammunition for riot control without knowledge of what their impact is on the human body”, Nayak asserts.